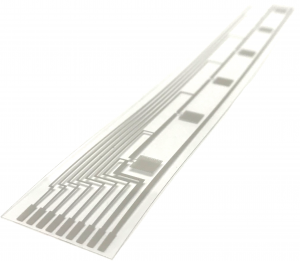 Brewer Science can deliver highly sensitive, printed, metal RTDs for precise measurement of temperature on large areas and array applications. RTD sensors can be used in a wide array of applications, enabling accurate, real-time responses to small changes in temperature. Our sensors provide full digital output with an onboard microcontroller for signal processing, have a flexible form factor, and can measure absolute temperature to within 1˚C. Resistive temperature detectors (RTDs) are devices that use resistance to show significant changes in temperature. These devices measure temperature by passing a low-level current through electrodes and measuring voltage drop across them. Flexible hybrid electronic (FHE) temperature arrays enhance many different applications and markets. Typically, users look for printed FHE systems when looking to measure temperature in confined spaces with narrow areas where typical silicon sensors can’t fit. FHE arrays are key for measuring multi-point surface temperature.